Moist, tender scones, packed with tart, chewy dried cranberries and woodsy pine nuts, are a welcome treat any time of the day – from breakfast to late-night snack. Baked to a light golden-brown, these scones are as tasty as they are pretty and they’re both quick and easy to make, so you can enjoy them hot from the oven whenever you like. 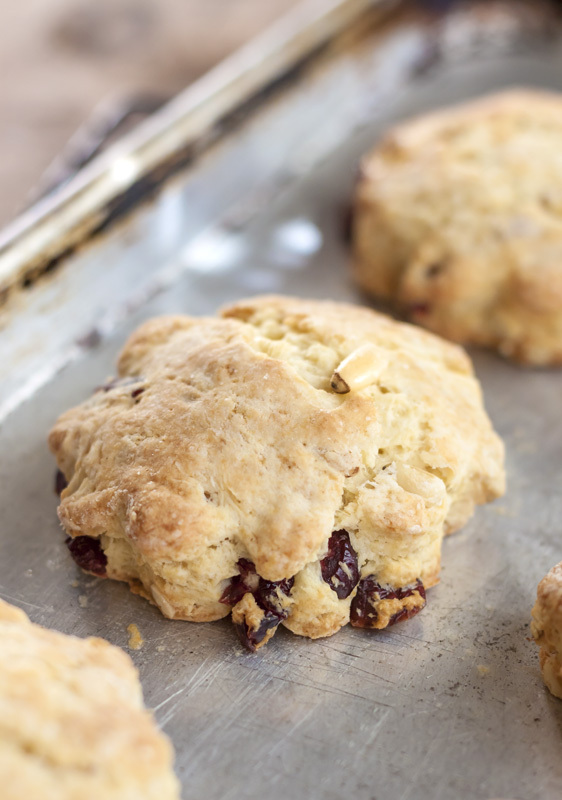 Scones can be made in different shapes – squares, triangles, rounds or wedges – whatever you like. The shape is less important than the technique used in making them. What’s most critical is minimizing the mixing and handling of the dough. The less you handle it, the flakier the scone. When mixing up a batch of scones, be gentle. Mix the dough just until the dry ingredients barely hang together. Don’t add more liquid than necessary and, above all, resist the urge to knead it. When you turn out the dough onto the floured work surface, gently pat it together and press it into shape with your hands. 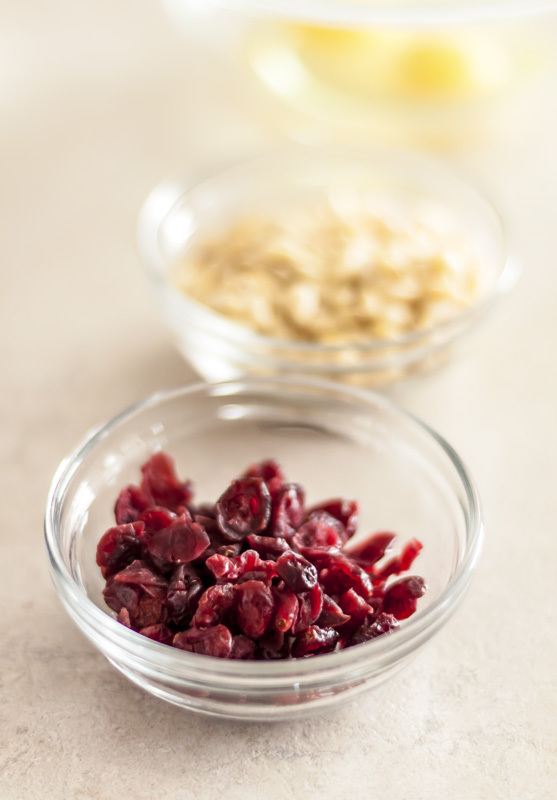 If the cranberries and pine nuts aren’t evenly distributed, you can fold it once or twice – but no more. Here’s another tip: leave the butter in small, discrete pieces. The best comparison in size is to lentils or grains of rice. Any smaller, and you’ll end up with more of a ‘batter’ than a ‘dough’ and, while still tasty, the scones won’t rise as high or be as light & flaky. Toasting the pine nuts brings out the full depth of their warm, woodsy flavor. You can toast pine nuts in the oven by spreading them on a sheet pan and baking them at 300 degrees F for a few minutes, or by swirling them in a shallow pan on the stovetop. Either way, watch them carefully and immediately remove them from the heat as soon as they develop light golden brown spots. They can go from nutty & delicious to scorched & inedible in a few seconds. Butter a baking sheet. Sift the flour, sugar and baking powder into a large bowl. Cut in the butter with a pastry cutter until the butter is the size of grains of rice (if you don’t have a pastry cutter, use two sharp knives). In a small bowl, beat together the milk and eggs. Stir the egg mixture into the flour mixture until just combined. Sprinkle in the nuts and cranberries and stir once or twice. 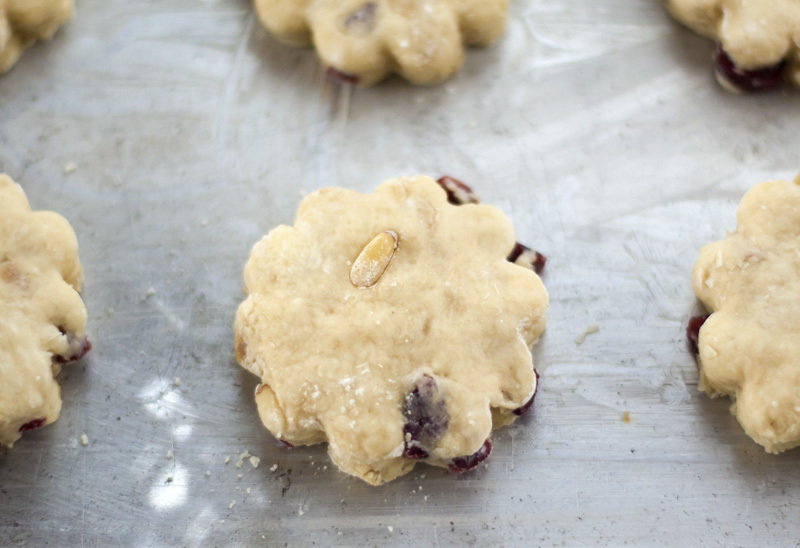 Turn the dough out onto a lightly floured surface and gently turn a couple of times, just until the cranberries and pine nuts are evenly distributed. Pat the dough into a flat disc about 1/2 inch thick. Cut into rounds with a 2 1/2-inch diameter floured cutter. Arrange the rounds on the buttered baking sheet about 2 inches apart. Bake the scones for 15-20 minutes, or until lightly golden. Makes about 12 scones. 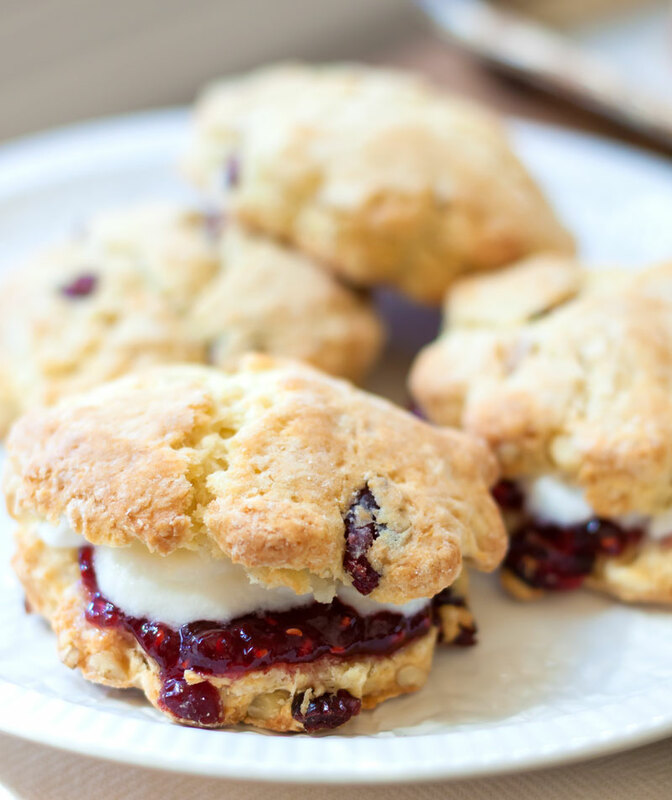 The English traditionally serve scones with clotted cream and jam. Since clotted cream is hard to find in the United States (unless you take the time & trouble to make it yourself), try warm scones with thick, strained yogurt or sweet butter instead. One more thing: As we all know from a lifetime of Thanksgiving Days, the tart, fruity flavor of cranberries complements poultry, seafood and roasted meats wonderfully. Leftover scones (if there are any) filled with thinly sliced turkey, smoked salmon or ham make great snack sandwiches.